his week I had the pleasure of getting to know up and coming owner of FUZZY INK. He gave us some insight as to what FUZZY INK is all about as well as all things MUSTACHE! So lets start off by introducing yourself and what you do at Fuzzy Ink? Fuzzy Ink has quite a fascination with all things mustache, and a few furry creatures to boot. Currently residing in Raleigh, NC our company consists of 3 people and with our powers combined we are…oh wait, wrong interview. I (John) am responsible for basically running the business side of things, which includes order fulfillment, marketing, networking and building customer relationships. I’m also a self taught screen printer and responsible for most of the printed designs. Mike, the hodge-podgerist of the company, is responsible for most of the creative things you see and read including design ideas, blog posts and product descriptions. He’s also the person behind the Fuzzies, spending countless hours on his sewing machine, Matilda. Justin, our creative director, is the right brained side of Fuzzy Ink. He’s responsible for most of our designs and handles all of our website needs. I have to get this out of the way, where did you come up with the name Fuzzy Ink? The name Fuzzy Ink was chosen after the concept of our brand and niche had already been sorted out. We really wanted something that played off of our mustache inspired designs, yet still gave us room to expand our ideas and illustrations in the future. How would you describe your line to someone that isn’t familiar with it? I would describe our line as mustache driven with an artistic feel to it. There’s definitely a humorous undertone to a lot of our designs, which can be seen with Game Over, Stache Anything and Mustache Ride, but we try to offer more artistically driven pieces as well (Striking, Sunstache Kid). If nothing else, we at least know that people will leave our website with a smile. I love the use of the Lego’s and Mario Characters on your shirts. Can we expect more 80’s and 90’s inspired throwbacks? 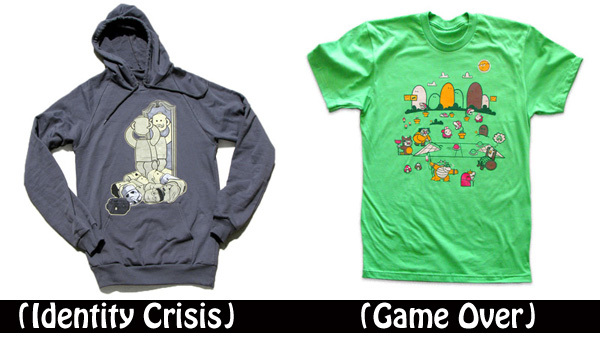 Identity Crisis and Game Over have definitely been very popular designs with our customers and we’ll certainly be offering more designs of that nature in the future. Parody inspired designs are always really fun to come up with, but it’s just about finding the ones that fit with our brand. So lets talk a bit more about these Mustaches you have mentioned. I see that you just released a line of plush staches, Where did you guys come up with that? We’re always playing around with new concepts and potential products and Fuzzies were something that we’d talked about for quite some time. The hardest part was actually taking them from the idea phase to production. But through a lot of trial and error we were able to get them to the look and feel that we desired. Most people may not realize it, but Fuzzies (and most of our other products) are made completely in house (literally in my house). From creating the template on the fabric, sewing, stuffing and tagging, everything is done by us. So each plushie is truly a one of a kind piece. Any other major plans for this year at Fuzzy Ink HQ? We’re always striving to come up with something different so we’ll continue to push ourselves in that department. We’re going to be quite busy with upcoming shows around the country so our goal is to meet new people everywhere we go and keep growing as a company. We still plan to release a new design/product once a month, but we’re also very picky about the quality of our work. If we’re not happy with the way something looks, we’re certainly not going to compromise the integrity of our designs. One thing I can offer is that we’re going to try and bring more of the women’s demographic into our brand. That’s all I’m going to say, so stay tuned. What are some brands that you looked up to when starting Fuzzy Ink? A few names that come to mind are Linty Fresh, Seibei and Full Bleed. All of them had a very good grasp on their own sense of style and that was very important for us when launching. It’s one thing to have good designs, but it’s another thing to be easily recognizable with regard to a specific brand. Their work ethic was also quite evident as well (as seen with their new releases and craft show displays). 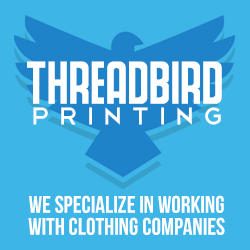 What are some of the biggest challenges you have faced in starting a clothing company? I think the biggest challenge we faced when starting Fuzzy Ink was trying to enter into an already saturated industry. But successful branding and having a niche market identity ahead of time really helped us to break through those barriers. I think a lot of newer companies struggle with this and it makes it very difficult when trying to market to a specific demographic. You may lose customers with a very specific brand (as I’m sure we do), but people will always know where to come when they’re looking for your specific item. Could you lend any advice to upstart clothing lines? The biggest piece of advice that I offer anyone interested in starting a clothing line is to really think about what they’re really willing to sacrifice to become successful. Starting and running a clothing line never has and never will be a part-time job. It can’t be if you really want it to succeed. Speaking from my experience I can tell you that quitting my job to run Fuzzy Ink full time was a necessary measure to get the company to where it needed to be. And although there have been plenty of times when I was sick of peanut butter and jelly sandwiches and mac n’ cheese for dinner I know that we wouldn’t be anywhere near where we are today if I hadn’t made that decision. There’s a reason why most businesses fail, but if you have the passion and drive to succeed then there’s no reason why you have to be part of the statistic. Well summer is now upon us, which means tons of summer shows! Will you be exhibiting at any craft shows or concerts this summer? Summer is an amazing time for indie craft festivals and we’re lucky enough to be traveling around for a lot of them. We’re currently getting ready for both Renegade LA and SF and then we’ll be hitting a few along the North East until the Renegade and ICE holiday shows. Meeting new people and sharing our products is by far the biggest reason why I love doing what I do. These shows are also very important for gaining exposure and building a larger customer base. Do you guys have any sales or coupons that our readers should know about? We’d love to offer IATT an exclusive coupon for all of your loyal readers. Simply enter Trendy as a coupon code during checkout and save 10% off of your total order.